Experience and trust are imperative in selecting a financial partner. 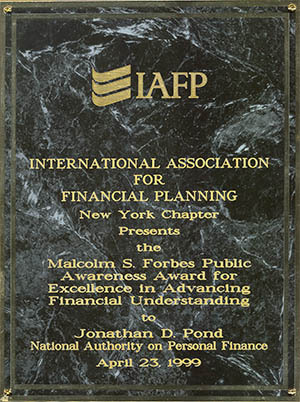 Jonathan D. Pond, LLC has the expertise to manage your portfolio without conflict of interest. We put your interests above our own. We offer exceptional service for individuals and familes with investments of $500,000 or more, backed by state-of-the-art technology, in depth research, and a customized investment approach. Our success is predicated on partnering with you to identify, implement, and monitor a higher personalized approach designed to meet your investment objectives. We are committed to providing outstanding performance, delivering exceptional service and cultivating enduring relationships with our clients. For 25 years, our clients have relied on us for expertise, service, and integrity. Never underestimate the importance of building an investment foundation. The recent worldwide stock market swoon is a more than ample illustration of the importance of building a foundation with your investments. Think of your investments as residing in a pyramid with three sections. The top section consists of your riskiest holdings, perhaps high yield bond funds and speculative stocks. The middle portion might include growth stock, precious metals funds, and emerging markets funds. The bottom portion of your investment pyramid is the foundation and, depending on your appetite for investment risk, often represents one-half or more of your holdings. It is comprised of less risky securities, perhaps including blue chip stocks that pay dividends, and U.S. government or high quality municipal and corporate bonds.